The Oosterschelde is a part of the Dutch Delta, the south western part of The Netherlands. Famous for its rich fauna, with many small animals swimming in the water, attached to substrates or living on the bottom. With some patience it is possible to find the larvae of animals like the common starfish (Asterias rubens) in the plankton and to follow the development of these larvae into miniature sea-stars. Larvae of other echinoderms are also present in the plankton, like those of sea urchins, sea cucumbers and brittle stars. Larvae of sea cucumbers and starfishes don't have a skeleton, those of sea urchins and brittle stars possess an internal skeleton, consisting of skeletal spicules, supporting the more elongate "arms" of the larvae. It is not always easy to distinguish between the larvae of the different species. May and June are good months for collecting larvae. You do not need large magnifications to see them. We will not have too much trouble in finding the larva of the common starfish. Most species of starfish shed their eggs and sperm freely into the water, so fertilization is externally. The very small chance of fertilization is compensated by the enormous amounts of eggs and sperm cells. A female starfish sheds in two hours several millions of eggs into the water, with a mean diameter of 0.16-0.19 mm . After fertilization, a hollow ball develops, called the blastula. 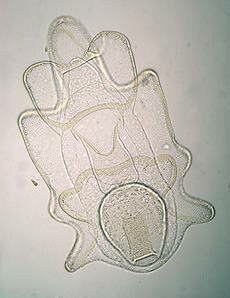 The cells of the blastula possess cilia on the outside for swimming. After one day a deep groove develops, leading to the gastrula. The gastrula's of all types of echinoderms are very similar. But then differentiation starts. The common starfish develops a so-called bipinnaria larva, with ciliated bands running about the periphery, a beautiful sight. 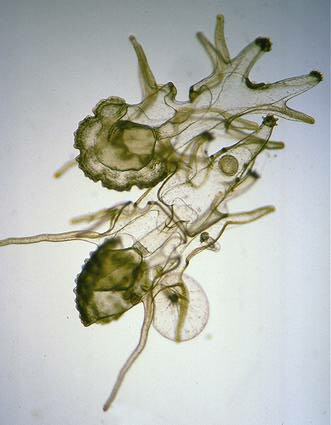 After several weeks the bipinnaria larva takes on a more elaborate form, with longer projecting arms and after some more weeks, a brachiolaria larva is formed. The larvae have their own gut, with inside cilia to inhale and transport food particles. They feed themselves with diatoms and other organisms in the plankton. The stomach is large and round and situated at the back side. 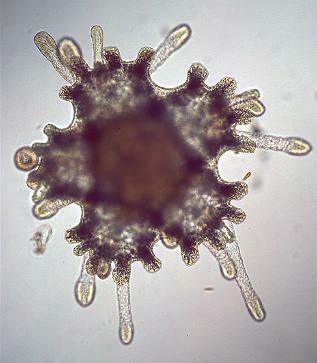 After this phase a large part of the larva degenerates and at the rear side a rudimentary formed juvenile starfish develops. The organs of the young starfish are formed anew. During this metamorphosis the late larva attaches itself to the benthos with three star-shaped , broad-ended arms. It is remarkable that the larva is bilateral symmetric, while the adult starfish has a radial symmetry. The microscopist, living not too far from the sea, can follow this marvellous metamorphosis. Some patience and perseverance are needed. The whole process, from egg to miniature starfish, takes about two months, depending somewhat on water temperatures. The newly formed starfish is ready for reproduction after about one year. Different shaped echinoderm larvae: echinopluteus stages of the common sand-burrowing heart urchin, Echinocardium cordatum. The right picture a younger stage, to the left an older stage showing clearly the internal skeleton. Comments to the author Jan Parmentier are welcomed.